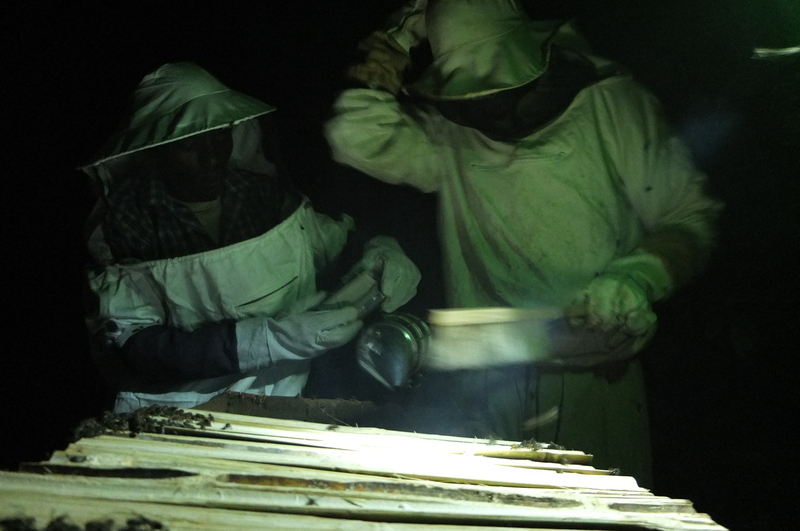 Beekeeping is done at night in Ethiopia, as the cooler weather requires that the bees maintain the colony’s temperature rather than sting it’s intruders. This at least is theory. 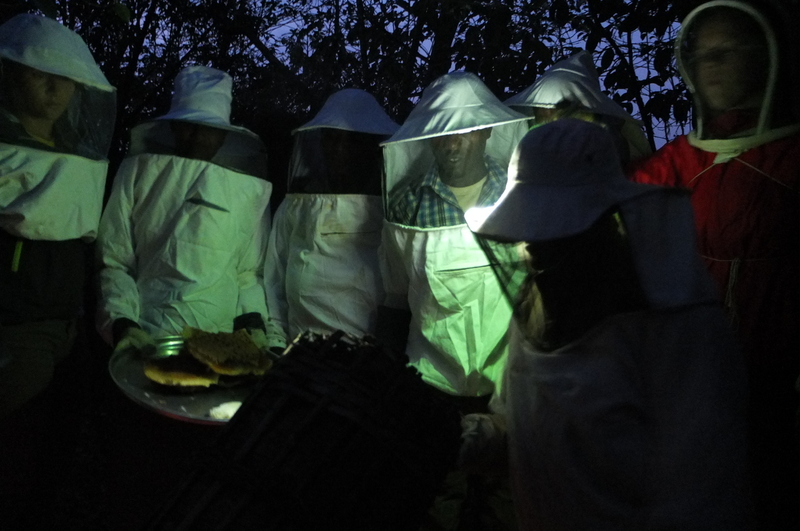 Under the illumination of a flashlight, the first step in transferring bees from a traditional hive to a transitional hive is to shake them from their home onto a clean plastic sheet. From this point on, every action must be done delicately, special attention must be paid to the presence of the queen for if she is lost throughout the process the colony will not succeed. Fresh smelling nectar filled the air as panel by panel the honey combs were removed. 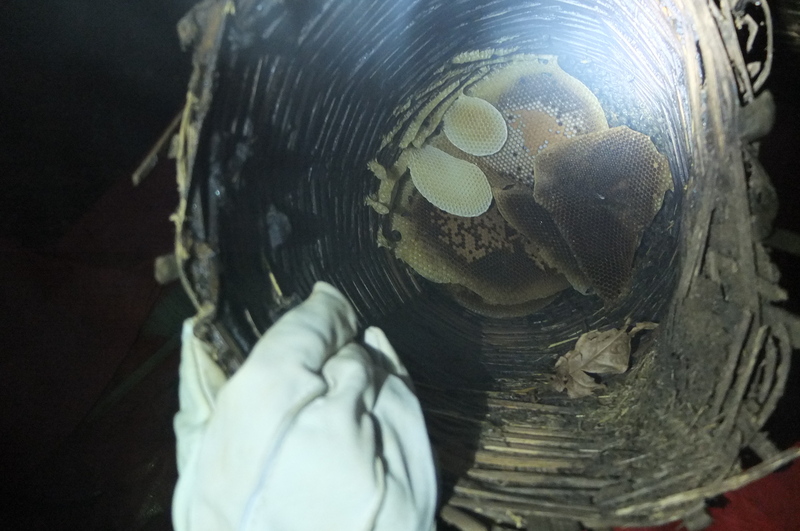 Brood combs, or freshly capped larva cells are what we are specifically after for transfer purposes. 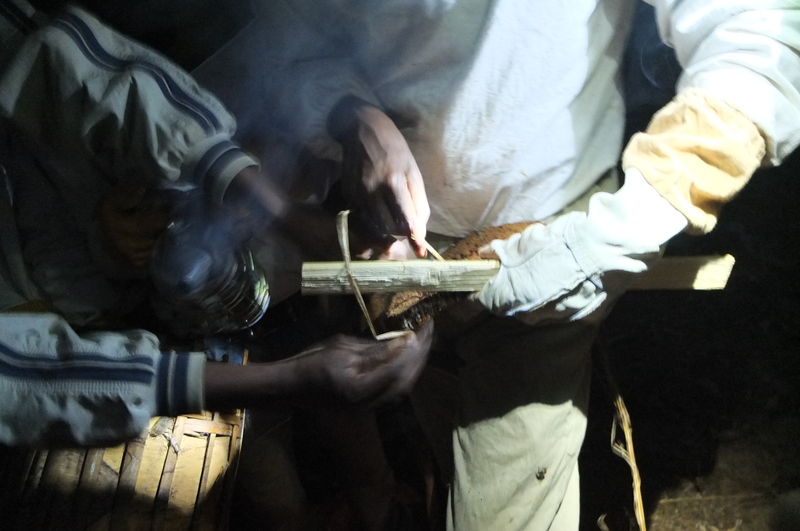 Using a wet strip of coffee bark, 2 of the biggest and most consistently laid brood combs are sown and hung from the top bars, and then placed into the entrance side of the colonies new transitional hive. 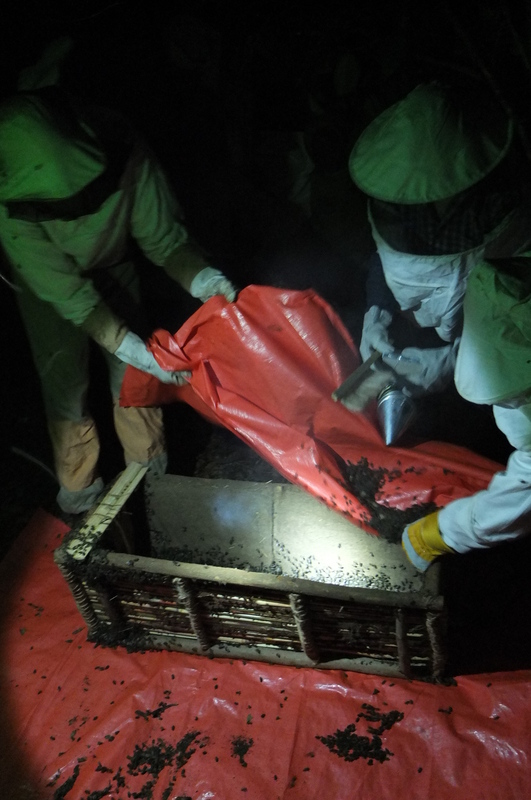 With the brood cells in place, the mass of honey bees previously shaken from the old traditional hive are carefully guided into their new home with the use of a plastic tarp. 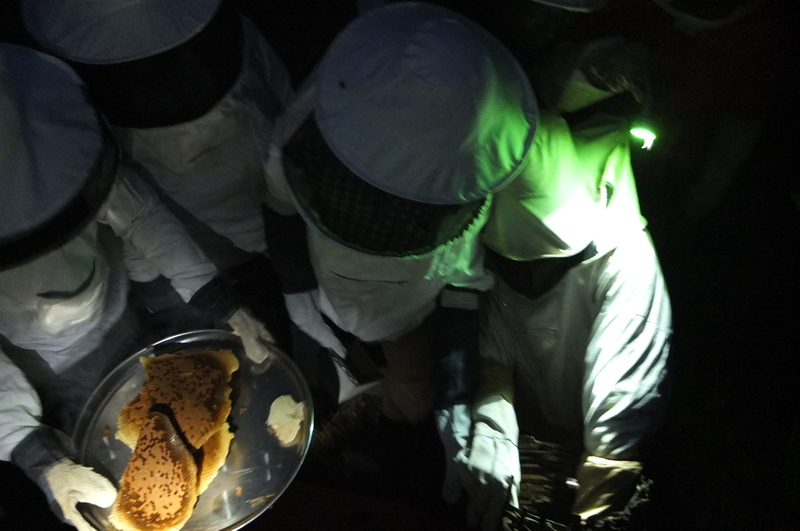 Watching the bees behavior helps to indicate the presence and locality of the Queen. As the Queen is the essence of the colony, their tendency is to surround her in one giant mass. A constant vibrating sound will also indicate the queens presence while a fluttering vibration can indicate her loss. 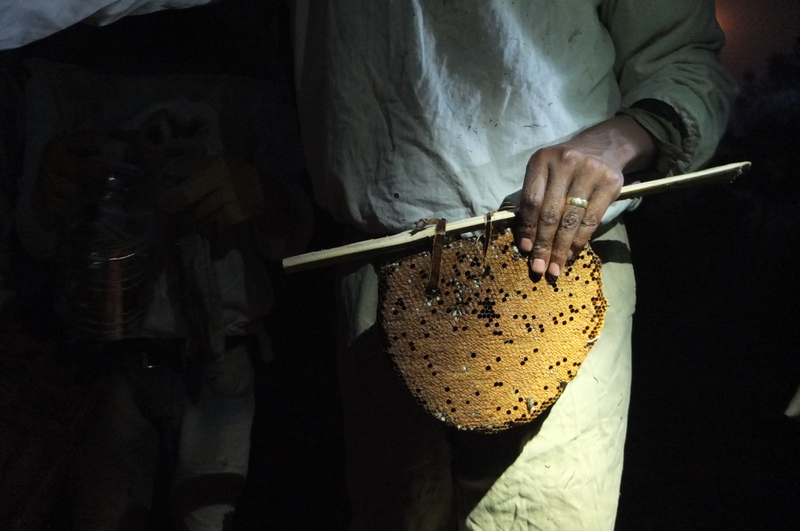 Once the majority of bees are inside their new hive, the hive is carried to its permanent location and with the use of a soft bristled “bee brush”, the outlying bees attached to the outside of the hive are brushed into their new home.